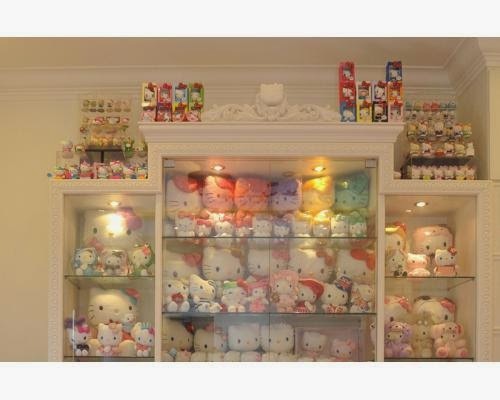 Below is a video of one of the many Hello Kitty collectors out there-- specifically in Singapore. 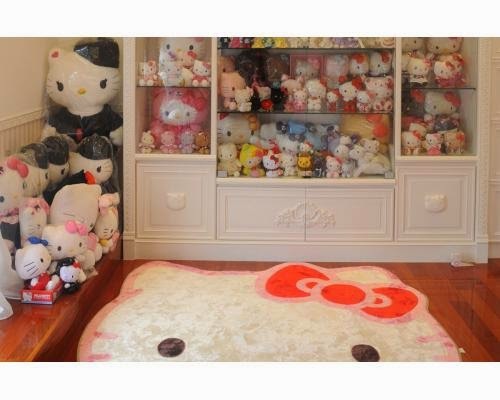 Her vast collection is something out of a fantasy world that even beats out Puroland's version because it's a kittified home to a T. It's like a shrine to Hello Kitty in every sense of the word. And most importantly, it's kittified in style and elegance. Something that I have been searching as well when it comes to Sanrio's characters. You can continue reading below or read the full article here and here. In food supplier Connie Sim's house in Katong, it is impossible to turn a corner without bumping up against Hello Kitty merchandise. The entire third floor is covered in floor-to-ceiling wallpaper featuring the Sanrio character's face and name. 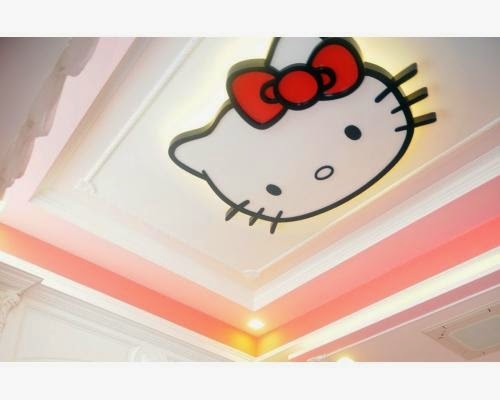 A 3-D mould of Hello Kitty's face is replicated on all of her cupboards, doors and drawers. Not to mention the hundreds of knick-knacks crowding every corner of her semi-detached house. In communal areas such as the kitchen, you can see a Hello Kitty toaster, coffee grinder, juice maker, slow cooker and dim sum baskets. 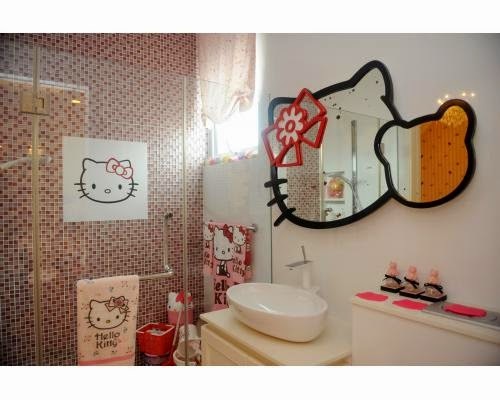 Even in private spaces including the bathrooms, Hello Kitty peers out at you from toilet paper, toilet seat covers, soap and laundry detergent. 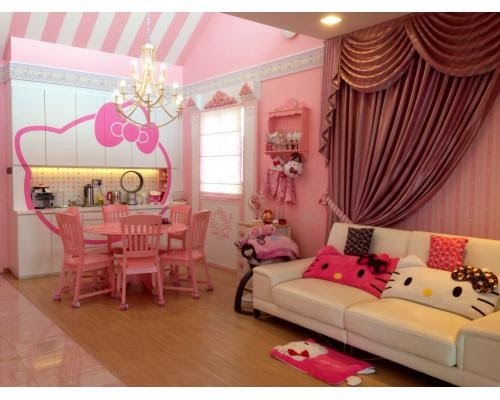 Madam Sim, a youthful-looking 60, says she spent about $1.2 million in 2013 on Hello Kitty-themed renovations. This excludes the money she blew on collectibles in the past 10 years. Which is why her next statement is pretty shocking. "I'm not particularly into Hello Kitty," she says in Mandarin. "I just like the colours pink and white." For this interview, she is dressed in a red T-shirt with Hello Kitty faces and a black flared skirt. Her voluminous coiffure - blown into shape by her maid - features girlish bangs. 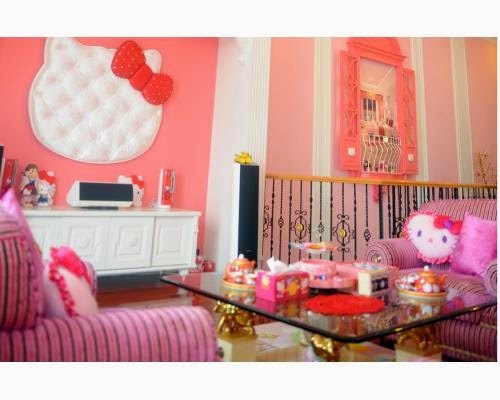 She elaborates: "I wanted my house to have a theme and since my friends like Hello Kitty, I decided I would have a classy, first-rate Hello Kitty home where everything looks fantastic." 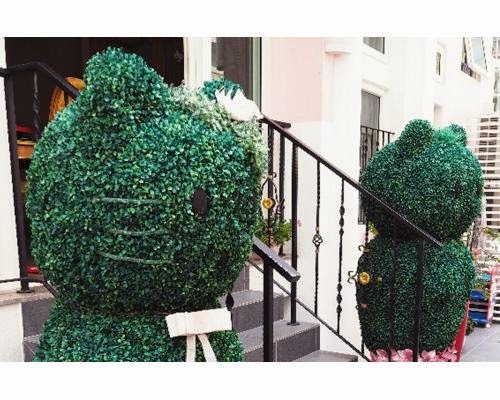 It is clear that even in the world of Hello Kitty devotees - known for their obsessive collections - her home is an epic shrine to the cartoon cat without a mouth. 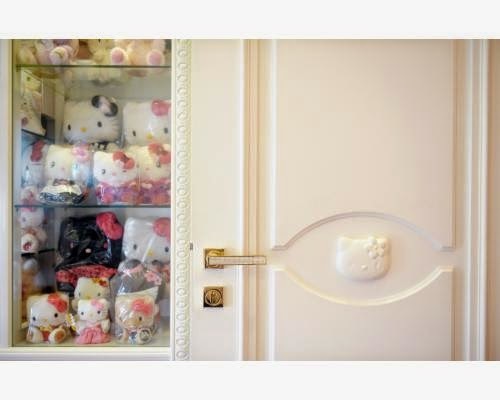 During a tour of the house, she takes the team up to her master bedroom, where she keeps Hello Kitty mobile phones, hair dryers, steamers, irons, and sewing machines. "Some of these I've never used, but I just like collecting them," she says. "I don't ask the price. I just buy." She gets her items from a supplier here whose shop she visits every month, but also regularly buys items from places such as Hong Kong, Japan and Taiwan, spending about $10,000 a year on her hobby. 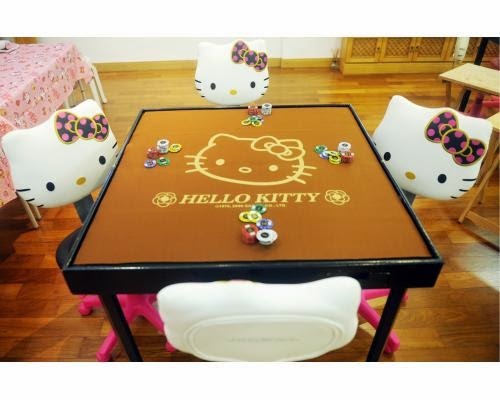 The divorcee says her three children aged 40, 36 and 34 do not mind her spending on Hello Kitty. "They say as long as Mummy is happy, they are happy." 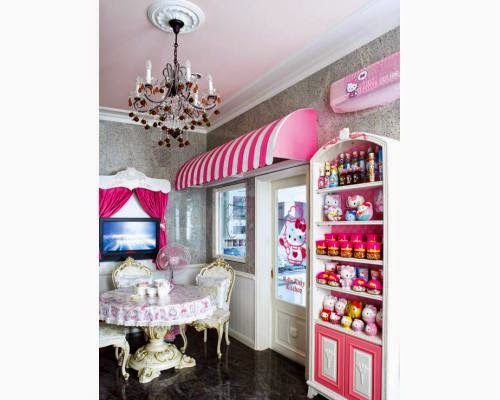 On the third floor of the house, Hello Kitty is plastered on cushions, carpets, fans, lights and cosmetic covers. One room contains Madam Sim's Hello Kitty clothing collection, which includes at least 100 T-shirts, 30 sets of pyjamas and many pieces of underwear. "I also have a Hello Kitty G-string," she says, rummaging through a neat pile of underwear in the drawer. 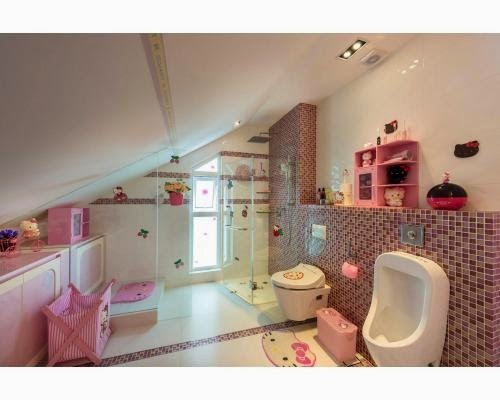 After this reporter's polite refusal, she leads the team to the basement, where there are two Hello Kitty-themed rooms for karaoke and mahjong games. These are open to her friends and family members during gatherings, which she organises regularly. "If you've done up your home nicely, you cannot be selfish and just enjoy it yourself. I believe in being generous." One of her friends, sales coordinator Linda Yeo, 39, says: "She first welcomed me to her home two years ago. I took so many pictures. 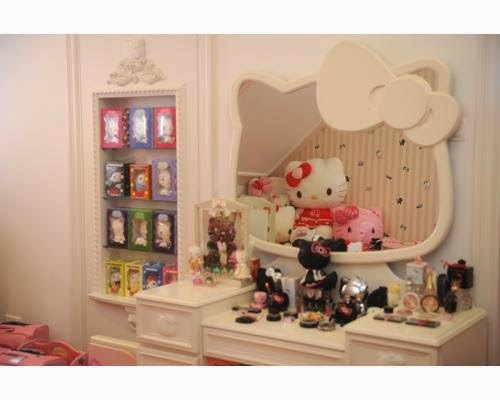 It's like a Hello Kitty museum here." Madam Sim says she has her fair share of naysayers - people who told her she is wasting her time or criticised her obsession with a cartoon character. But she respectfully disagrees. "I'm not throwing money away," she says. "This is going to last me for many years, beyond the life of a million-dollar sports car." 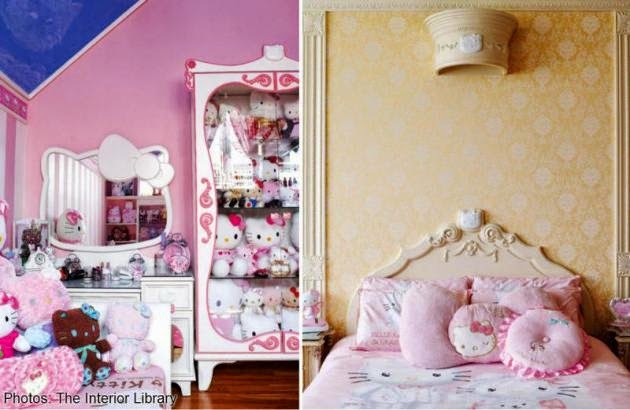 This Hello Kitty fan got The Interior Library to customise every square inch of her home to match her overwhelming love for the Sanrio character. Connie's favourite shop in Singapore to get her Hello Kitty fix is Kai Kai Gifts at Chinatown Point. She says Hong Kong and Taiwan are also places with great Hello Kitty merchandise - even better than Japan! 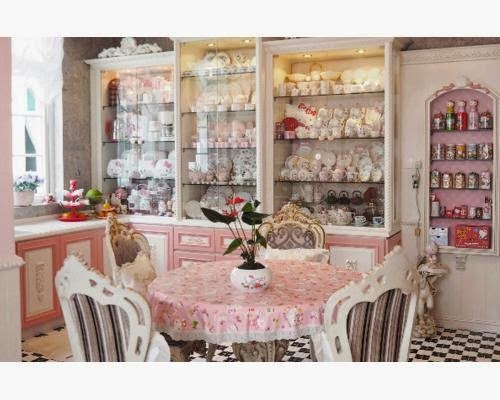 Her collection includes usable Hello Kitty kitchenware and cutlery. She even got a striped awning and clear window panels installed to complete the illusion of a streetside café setting for the kitchen. The drawer fronts in the kitchen were tailored to match the European-chic feel of the space. The master bedroom exudes a dignified air with grand gestures like the round ceiling alcove above and bespoke furniture. The feline's face is even moulded onto the customised headboard of the bed. 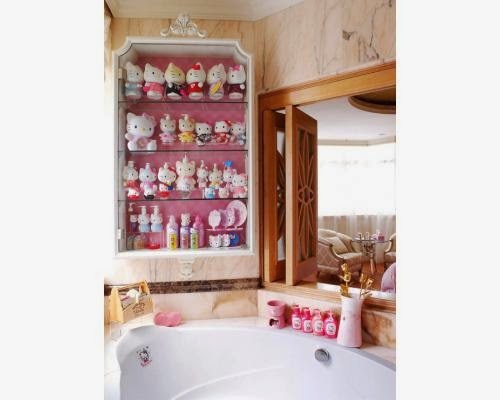 Hello Kitty bath products like liquid soap dispensers are all on show in the master bathroom. Quench your thirst at the bar, which also displays Hello Kitty pencils on the counter. Tucked away in the basement, this music room has customised display shelving to organise Connie's big collection.